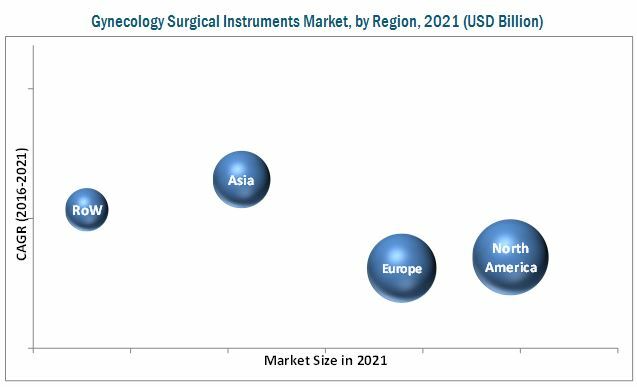 [139 Pages Report] The gynecology surgical instrument market is expected to reach USD 2.44 Billion by 2021 from USD 1.73 Billion in 2016 at a CAGR of 7.1% during the forecast period. Major factors driving the growth of this market include a high incidence of gynecological diseases, increasing awareness of gynecological diseases, and rising government investments for providing advanced healthcare facilities & services. In addition, emerging Asian markets have opened an array of opportunities for players in this market. However, the increasing preference for robotic surgeries may restrain the growth of this market. North America dominated the global gynecology surgical instrument market in 2016, with the U.S. accounting for a major share of this regional market. Factors such as high incidence of gynecological diseases (such as ovarian, uterine, cervical, and vaginal cancer), increasing awareness programs, rising funding for research projects in gynecology, prominent players focusing on strengthening their presence through acquisitions and expansions are likely to drive the growth of the North American market. Followed by North America, Europe dominated the global market in 2016. The European market is mainly driven by increasing adoption of surgical procedures in gynecology, high incidence of gynecological diseases, increasing governmental initiatives for supporting medical innovation, growth of the European healthcare sector, and awareness programs. Various prominent players are focusing on strengthening their presence in the European market through acquisitions, expansions, and product launches. For instance, in March 2014, KARL STORZ Endoscopy (UK) Ltd opened its newly redeveloped plant in Dundee, Scotland with an investment of USD 2.8 million (GBP 1.7 million). The plant focuses on medical device manufacturing. The Asian market is slated to grow at the highest CAGR owing to the increasing government and private sector investments in healthcare, growing purchasing power, high incidence of gynecological diseases, government initiatives focusing on women’s health, and improvements in the healthcare sector of Asian countries. Some prominent markets in Asia include China, India, and Japan. The gynecology surgical instrument market is fragmented with several global as well as local players. Players offer several products across different subsegments of this market. Key players in this market include KARL STORZ GmbH & Co. KG (Germany), Richard WOLF GmbH (Germany), Olympus Corporation (Japan), CooperSurgical Inc. (U.S.), MedGyn Products (U.S.), Sklar Surgical Instruments (U.S.), and B. Braun Melsungen AG (Germany). This report categorizes the gynecology surgical instrument market into the following segments and sub segments. Note: Other surgical instruments include uterine sounds, uterine depressors, and uterine curettes. With the given market data, MarketsandMarkets offers customizations as per the company‘s specific needs. 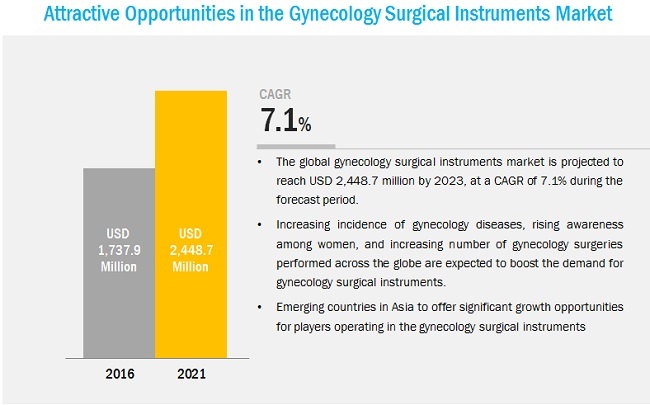 The gynecology surgical instrument market is expected to reach USD 2.44 Billion by 2021 from USD 1.73 Billion in 2016, at a CAGR of 7.1% from 2016 to 2021. The market is mainly driven by factors such as high incidence of gynecological diseases, increasing awareness programs, and rising government investments for providing advanced healthcare facilities & services, increasing disposable income in developing countries, and rising incidence of lifestyle disorders. The market in this report is segmented on the basis of products applications, end users, and regions. Based on product, the market is segmented into forceps, scissors, needle holders, dilators, trocars, vaginal speculums, and other instruments. The forceps segment dominated the market by holding the largest share in 2016 and also experience the highest growth during the forecast period. The high growth in this segment is attributed to the increase in the number of gynecological surgeries, and the repeated use of forceps in most gynecological surgeries. Based on application, the market is further divided into laparoscopy, hysteroscopy, dilation and curettage, colposcopy, and other applications. Laparoscopy forms the largest and fastest-growing application segment of the global market. This is mainly attributed to the various advantages of laparoscopy procedures, which includes less blood loss, shorter hospital stays, and fewer intraoperative & postoperative complications. Hysteroscopy forms the second largest segment due to factors such as the increasing incidence of fetal deaths and rising demand for minimally invasive surgeries. Based on end user, the market is segmented into hospitals, clinics, and ambulatory surgery centers. Hospitals and clinics are expected to dominate the market for gynecology surgical instrument. Growth in this end-user segment can be attributed to the increasing incidence of diseases such as endometriosis, uterine fibroids, gynecological cancers and the subsequent increase in the number of gynecology surgical procedures. The global market is dominated by North America, followed by Europe, Asia, and the Rest of the World (RoW). The market in Asia is expected to grow at the highest CAGR during the forecast period. Factors such as increasing awareness programs, high incidence of gynecological diseases, increasing number of hospitals, government initiatives focusing on women’s health, and improvements in the healthcare sector of Asian countries contribute to the growth of the market in Asia. Key market players are B. Braun Melsungen AG (Germany), CooperSurgical Inc. (U.S.), Ethicon, Inc. (U.S.), KARL STORZ GmbH & Co. KG (Germany), KLS Martin Group (U.S.), MedGyn Products (U.S.), Olympus Corporation (Japan), Richard WOLF GmbH (Germany), Sklar Surgical Instruments (U.S.), and Tetra Surgical (Pakistan). 5.2.2.1 Reductions in Medicare Payments to Healthcare Providers in the U.S.